↑ Van Helmont's date of birth has been a source of some confusion. According to his own statement (published in his posthumous Ortus medicinae) he was born in 1577. However, the birth register of St Gudula, Brussels, shows him to have been born on 12 January 1579 Old Style, i.e. 12 January 1580 by modern dating. See Partington, J.R. (1936). 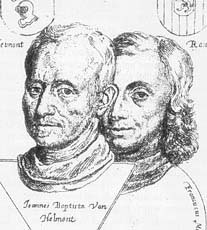 "Joan Baptista Van Helmont". Annals of Science. 1: 359–84 (359). doi:10.1080/00033793600200291. ↑ Digitaal Wetenschapshistorisch Centrum (DWC) – KNAW: "Franciscus dele Boë"
↑ "Helmont". Random House Webster's Unabridged Dictionary. ↑ Holmyard, Eric John (1931). Makers of Chemistry. Oxford: Oxford University Press. p. 121. หน้านี้แก้ไขล่าสุดเมื่อวันที่ 19 สิงหาคม 2558 เวลา 01:04 น.